Packaged in a convenient, sturdy, styrene box for use in home, shop or field. Because special tools are not needed for Re-Nu-Thread installation, these kits provide a quick, easy way to repair a wide range of threaded holes in many materials. 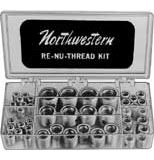 Contains assorted sizes and quantities of the most popular Re-Nu-Thread inserts. Refills for the Kits or any size Re-Nu-Thread can be purchased separately.